I love draft events. Sure, there's something to creating a deck ahead of time and making sure it's as tightly-wound as you can. But there's also something to flying by the seat of your pants, making your deck from a limited set of cards and having to use only your wits and skill to make it through. Star Wars: Destiny has new draft packs that you can use to have some cool events with. A new style of play has opened up for you to explore. The Rivals Draft Set for Star Wars™: Destiny is on sale now from your local retailer or online through our website! Darth Maul and Boba Fett take on Rey and Qui-Gon Jinn on the frozen tundra of Hoth. General Grievous and Grand Moff Tarkin do battle with Finn and Wedge Antilles on the volcanic planet of Mustafar. Star Wars™: Destiny has always allowed you to play out what-if battles in the Star Wars galaxy. Now, prepare for a new way to play with the Rivals Draft Set! 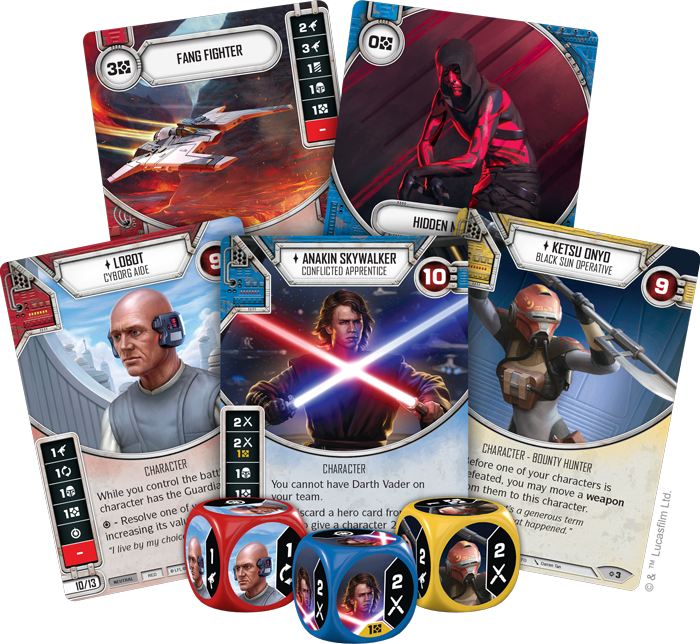 Rivals introduces an entirely new way to play Star Wars: Destiny, using a Rivals Draft Set for any number of draft or sealed format games! Draft lets you compete against your friends to build the best deck from a shared pool of cards. Each player will have a single Rivals Draft Set, along with a pool of booster packs from any set (six per player). Players select individual cards from booster packs to mix with their Rivals Draft Set to create a deck. In the sealed format, on the other hand, players open all of their packs and their copy of the Rivals Draft Set at once and construct a deck from their unique pool of fifty cards. Sealed and draft play present a fresh new way to experience Star Wars: Destiny, and once you own a copy of the Rivals Draft Set, you will always be able to use it to participate in either of these unique formats. For an in-depth preview of how the draft format works, click here! After deck construction, players will play a series of games, using their new decks to see how they stack up against each other. While the cards from your booster packs will make up much of your deck, the heart of the experience lies in the cards found in Rivals.